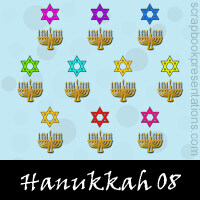 Download Hanukkah PowerPoint templates, embellishments, Snagit stamps and more goodies here. 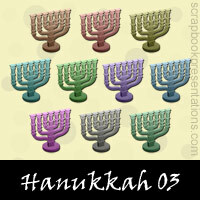 Hanukkah (Chanukkah) is an 8 day Jewish festival commemorating the rededication of the 2nd temple in Jerusalem. 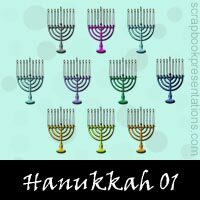 It's also known as Festival of Lights, as it is observed by the kindling of the lights of a special candelabrum, the Menorah or Hanukiah. The festival is celebrated for 8 days, one light is lit on each night of the holiday. On this festival, families exchange gifts each night, and fried foods are eaten. You can learn more about Hanukkah on Wikipedia. 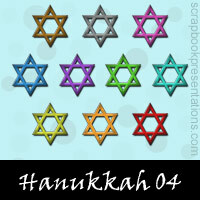 See a visual presentation (scroll down this page) and download a Hanukkah PowerPoint presentation.